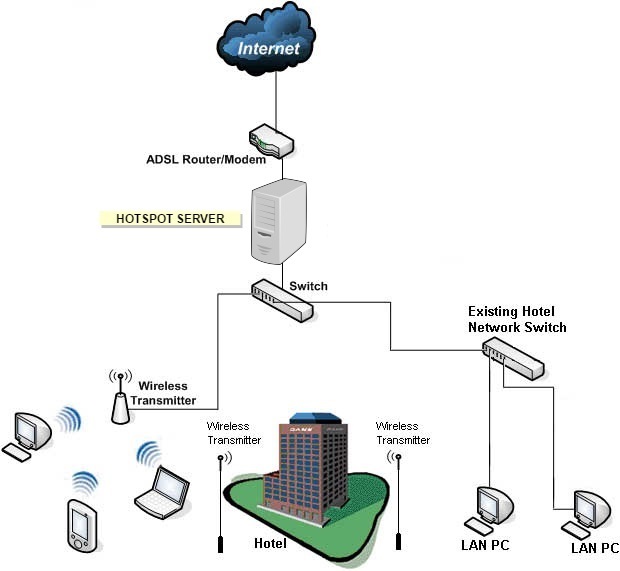 Hotspot Express, well-known for its technical prowess always meets the customers' requirements exactly, whether it is a single hotel or chain of hotels; whether it is managed with simple prepaid voucher login or room based login (integrated with hotel management software, offering complimentary access for room-guests on per-day basis or paid-access, etc.). The software will be installed in a PC/Sever with two NICs (network interface cards). One NIC is connected to Internet router and another NIC is connected to Guest LAN network (with Wired Network or WiFi network or both) so that all the guest users can access Internet only through the hotspot server. When the user tries to access Internet, the hotspot server will catch the Internet traffic and insert the login page right into the users' browsr. The login page usually prompts for username & password. You can also add a foot-note in the login page as 'Please contact reception for getting WiFi Vouchers'. Under each plan, you can print any number of vouchers; for example, in a single A4 sheet, you can print 10 vouchers and cut these vouchers and distribute them through receptionists. Each voucher is printed with randomly generated username & password. If the hotel feels that printing & distributing the vouchers are inconvenient, the hotspot server can be directly integrated with the Hotel Management Software (eg. IDS, WinHMS, etc) and the user can be authenticated using Room-Number & First Name (or Last Name or etc). If the hotel wants to offer Free-Access for Conference Hall Attendees or Fun Parties, but still wants to authenticate them, the best option is using 'SMS based OTP authentication'. The hotspot server can be integrated with Hosted SMS Servers (or with Serial/USB SMS Modems) and the users will be authenticated by OTP (One Time Password) sent through SMS. The software will be installed in a centrally located PC/Server with Public Static IP number. In each hotspot location, there will be a location-router. This location-router consists One WiFi port and Four Wired Ports. The location-router will insert the login page to the new users, and will authenticate the users by consulting with the central hotspot server. This central server can be installed either inside your premises or in a cloud server as per your requirements. Centralized RADIUS Server PrePaid and PostPaid Packs Creation with PIN numbers. Time/Volume/Bandwidth based Rate Plans Unlimited Service configuration. (Enables different price plans, Service bundling, in addition to discount and bonus options). Reseller Account support and reports. Web Based Administration, Viewing Reports and user support. MAC address automatic authentication, if necessary. Redirection to provider's "Terms and Conditions" Page before access. Configurable Portal Page for user access showing the providers logos and links. Web Self Care module to enable users self account administration. Free Access to Specified domains and websites. MB Limitation based on user account or Mac address. Bandwidth Limitation based on user account or Mac address. Automatic session timed out, after the prepaid account is completed. Live reports, statistics and analysis Reports on Bandwidth, Data Transfer, etc and export in CSV format. The software can be on public IP and the clients can be behind NAT In-built DNS, DHCP server and firewall support.